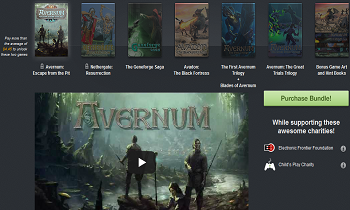 Humble Bundle's weekly sale will feature Spiderweb Software's RPG library until July 18th. If you haven't heard of Spiderweb Software, you've been missing out. Founded in 1994, it's produced a venerable library of lengthy role-playing games that, though low tech, have entertained countless fans of classic RPGs. If that wets your appetite at all, you may want to take a peek at the Humble Weekly Sale presently running over at Humble Bundle. Contained within the current sale are fifteen of Spiderweb Software's titles and while some are simply remakes of other games included in the overall sale, the sheer amount of content you can get, even just paying the minimum one dollar, is pretty impressive. Likewise, with the current average only standing at $4.45, you won't even need to lay down five dollars to pick up the complete package. Now, there are some obvious caveats to Spiderweb's games. A second's glance is all you'll need to see how decidedly indie their production values are. That said, visuals don't make the game and, if you're willing to look past some of the rougher edges, Spiderweb's library contains a lot of depth and content that fans of old school role-playing games can love. Avadon: The Black Fortress is arguably well worth the price of the package by itself. Coupled with fourteen other games it's, simply put, just a great deal. If you fancy buying Humble Bundle's Spiderweb RPG package, you have until Thursday, July 18th, after which it will be replaced by the next Humble Weekly Sale.